Woohoo!!! My first ever blog entry (and marriage). First off, let me say another welcome! We are so excited to bring our family and friends together to sing and dance and celebrate with us. Planning this event has been a wonderful opportunity to ask “hmm…how can we reverse climate change and save humankind?” Or, perhaps more realistically, how can we create a life together that is gentler on the planet? In turn, we have been inspired in ways that we did not anticipate. So as not to overwhelm you with gratuitous inspiration, I think I will write a series of shorter ‘deep blog thoughts.’ Today’s inspirational topic is the love, love, lovely EcoNest® at Riverstone Retreat Centre (where our parents and Aunt Judy will stay for the wedding). 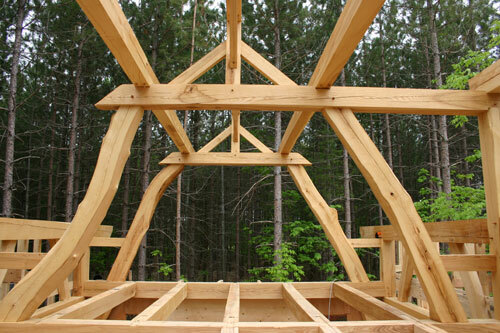 The EcoNest® was built using straw, clay and timber gathered from the surrounding property. At the end of the build, there was less than a truckload of waste! Extra clay went back in the swamp and straw back in the barn. This is the first house of its kind in Canada (although the technique is centuries old) and it is truly a work of art. The walls are breathable, so there are no allergens in the air and the temperature is always just right. 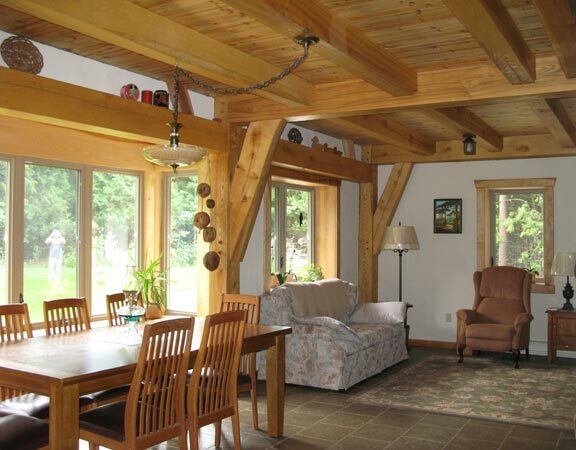 The wood twists through the house in magical ways and the exposed beams add an extra touch of awesomeness. My favourite feature is the beautiful stone oven running up the centre of the house and heating the air, floor and water pipes (and potentially cooking food as well!). It is incredibly efficient as was demonstrated when we made our first visit there on a frigid winter day (-15° C in the sun). Ernie had fed the stove a small handful of wood early that morning and when we arrived at 2:30pm, it was 20° C and the radiant in-floor heating thawed out our toes immediately. We were so captivated that we just knew we needed to get married there and share the EcoNest® with all of our friends and family. This inspiration has transcended our wedding day and elicited many fantasies about our lives together. I can’t stop day-dreaming about building our own EcoNest® one day and raising a little family there. It helps me to reconcile the oil heating and drafty windows we have in our current home. 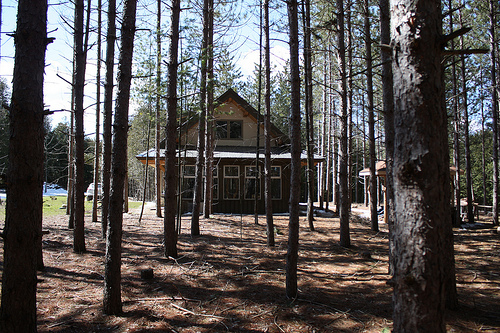 To learn more about the construction of the Riverstone EcoNest® visit: www.naturalbuild.ca . For more information on other beautiful EcoNest® homes check out their company website: www.econest.com . Many thanks to Holly Monster and Ali Lam for allowing us to use their beautiful photographs! From this EcoNest to your ‘green’ invitation, from a family Friday night celebration to the family making wedding pies…all suit you both beautifully! Sooooo looking forward to being part of your wedding and to having Aaron become an ‘official’ member of the Embrey Clan. Thanks for your lovely words Lorna! (and thanks for kicking off the comments) We both feel very lucky to have such wonderful families. George and I loved Riverstone…it is definitely on our list for a future vacation spot. Wouldn’t that be a great place for the family reunion? You two are something else…what a splendid place for a wedding! The rain didn’t spoil a thing. In fact it was probably a blessing…it wasn’t too hot and we weren’t bothered by bugs. It was certainly a memorable day. As you can tell, you’re both scoring very high in all areas.